Being British I love an underdog story. We do really love a “tryer”. It must be baked into our national psyche thanks to years of below-average performance at most sports. There’s also a suggestion that maybe Brits just hate successful people. It’ll then come as no surprise that as a result, I have a surprising affinity for Bing Ads over Google Adwords. Me, centre, fooling around at HeroConf London, 2016. Oh no. 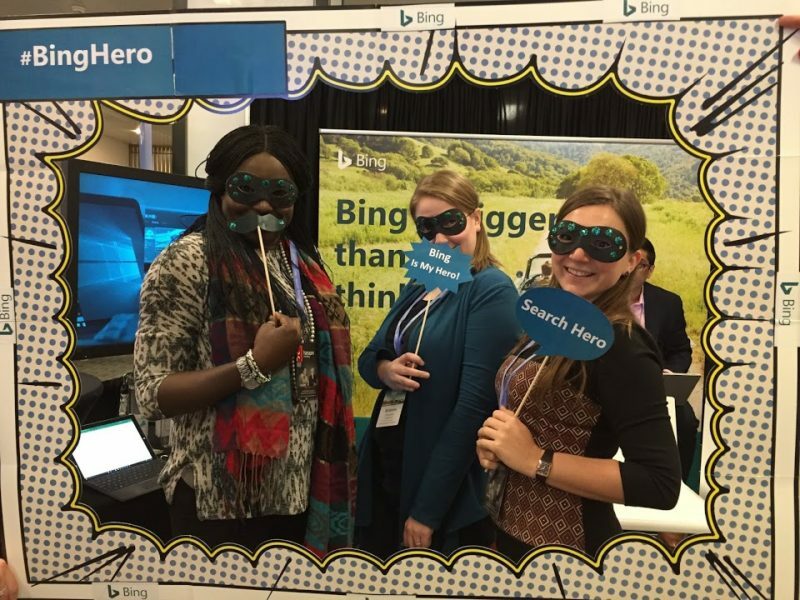 My love for Bing isn’t the result of them being the underdog in the paid search world. There’s actually a lot of things that Google could stand to learn from Bing and some of the things they do better. On some levels Google knows this and has copied a number of Bing-only features, such as Quality Score component reporting, demographic modifiers in search, reinstating tablet-specific bidding and adding support for PPC pros vis Twitter. They’ve also copied their amazing Campaign Planner features in the AdWords Keyword Planner – to the point where it’s essentially a duplicate with different branding. 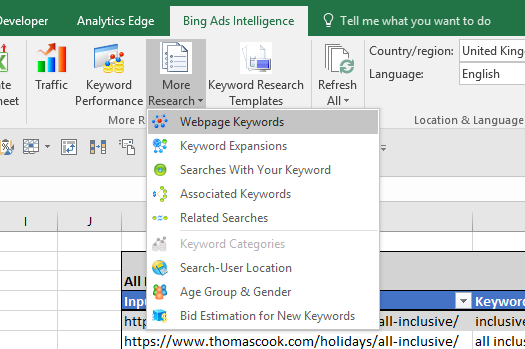 What I want to do is flag-up some Bing Ads only exclusive features and tricks that you probably didn’t know existed – that can, in some cases, add value for your campaigns in Google AdWords as well as the activity you’re running in Bing Ads. Let’s start with features which focus around transparency. It’s long been a point of irritation amongst PPC Pros that Google don’t allow you to view specific site performance when you target their Search Partner network. As a result, you’re unable to exclude specific partners that might deliver sub-par performance, in the way that you can for a site on the Google Display Network. In Bing Ads, you can run a Website URL report which shows you the performance for websites on the main Bing network and also on the syndicated search partner sites (the same as Google’s Search Partners). It’s also important to note that you can selectively exclude partner sites – you don’t have to exclude a site from your whole account because of poor performance in a single campaign or ad group. 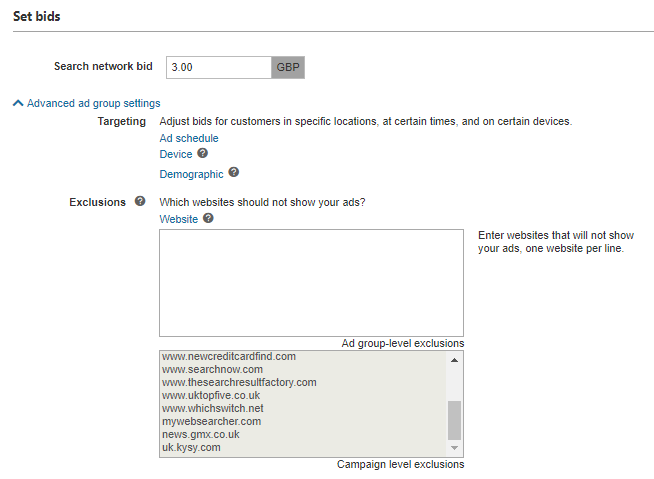 Within Settings, you can apply ad-group level exclusions that will take precedence over anything you apply at campaign level. 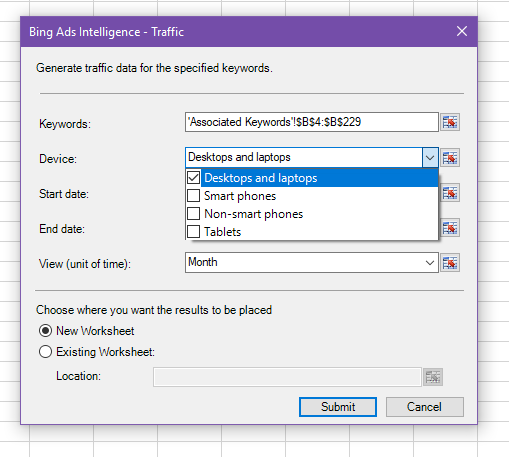 Bing’s tool to let you import your campaigns from AdWords has been around for a while – first in the interface, and then via Bing Ads Editor – which is a great way to check campaigns and make any amends before putting things live. Hands-down, it’s the best way to manage a large scale import. Once you’ve done that initial import though, it can be all too easy to miss updating Bing with the same changes that you make to Google – whether it’s introducing new keywords, writing new ads, or testing new landing pages. The automated import function solves this problem – allowing you to import changes from your AdWords campaigns directly into Bing Ads. 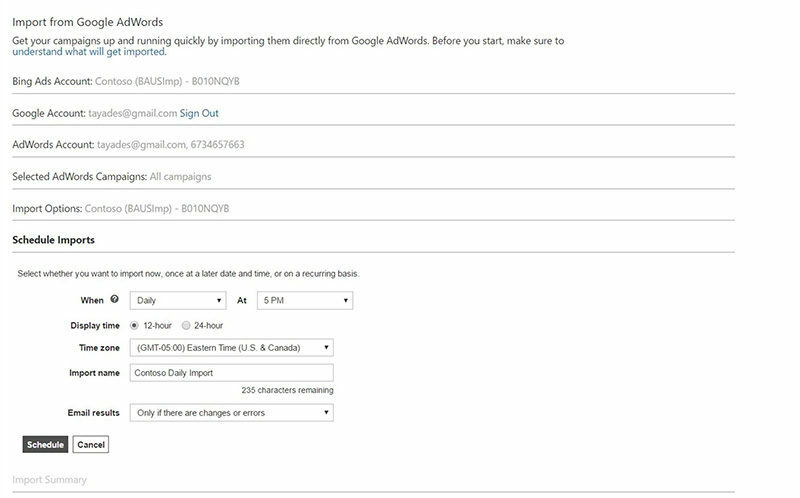 Simply navigate to Import Campaigns -> Import from Google Adwords and follow the prompts. At the bottom, you’re given the option to schedule imports, on a daily, weekly or monthly basis. You can also get the system to email you the results; if there are changes, if there are errors, or every time it runs. Once that’s done and if you want to ever view the schedule or see past imports, simply go to Import Campaigns -> Import Schedule & History and you’ll be able to see everything from the last 90 days – allowing you to review and fix any errors, if any were found during the import process. 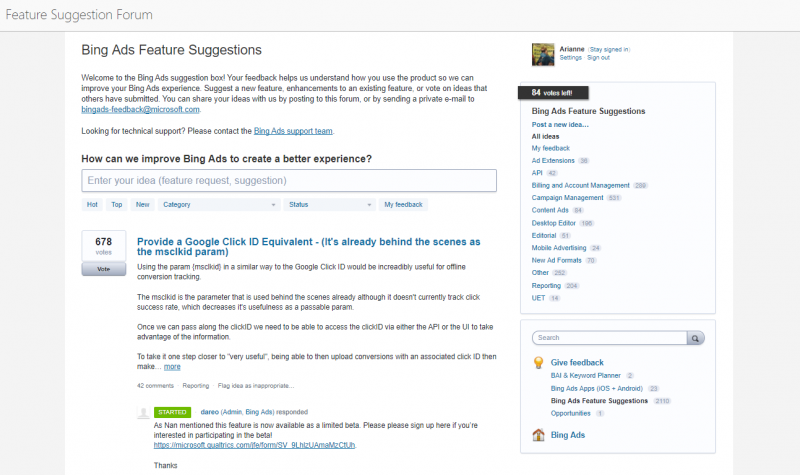 One of my favourite features is Bing Ads Feature Suggest Forum. I’ve been a member of this for years now and it’s where you can go to suggest new features that you’d like to have added to the Bing Ads platform. Other users can then vote up your ideas, comment on them and you can see feedback from the Bing Ads team. I’ve suggested a couple of ideas that have been started by the Bing Ads team – it’s thrilling to make a suggestion and then be able to discuss it with one of the engineers, before it then becomes an actual part of the platform. Between the forum and the great support you get on Twitter, I feel quite listened to as a customer. You could argue that it’s a great point of differentiation for Bing given their smaller market share, but I believe it’s representative of a desire for collaboration and partnership with their customers which can be a nice contrast compared to the Big G.
What is it? 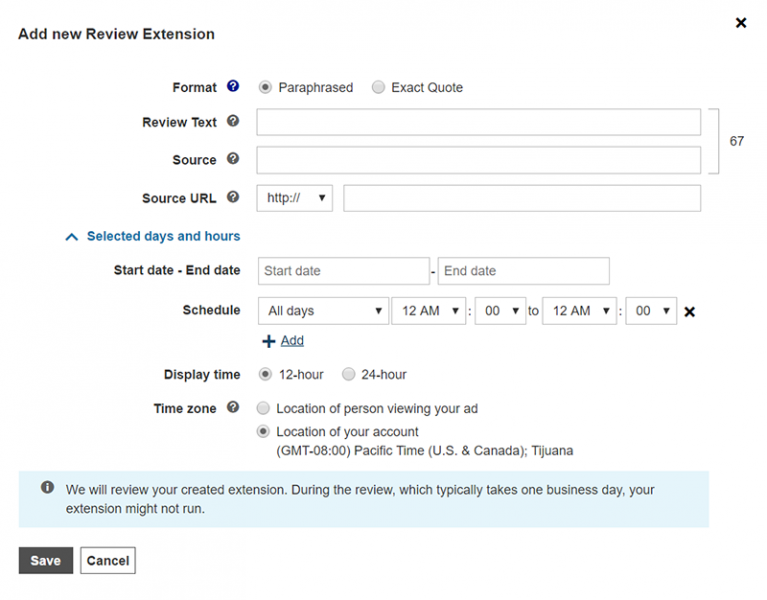 Well in AdWords, all scheduling of ads and extensions is specific to the timezone of the account when it was created. So if you’re based in the UK and run campaigns for the UK and USA from a single account, if you schedule an ad extension to appear from 09:00 – 17:00 GMT, on the east coast of the US it would show from 04:00 – 12:00 and on the west coast from 01:00 – 09:00 – useless if you’re trying to target business hours. This can easily be solved by creating separate campaigns with different ad schedules, but if you’re targeting the US, this would mean you’d need a duplicated campaign for every timezone – not exactly convenient. With this one radio button, you ensure that your ad extension will only be shown to customers when that timezone is specific to them – alleviating the issue of needing to duplicate campaigns to gain control of schedules. It’s such a simple thing, but of all of the things I’m covering off in this article, possibly the most impactful. Using the online keyword planners is fine, but if you want to take the data and manipulate it further (e.g. 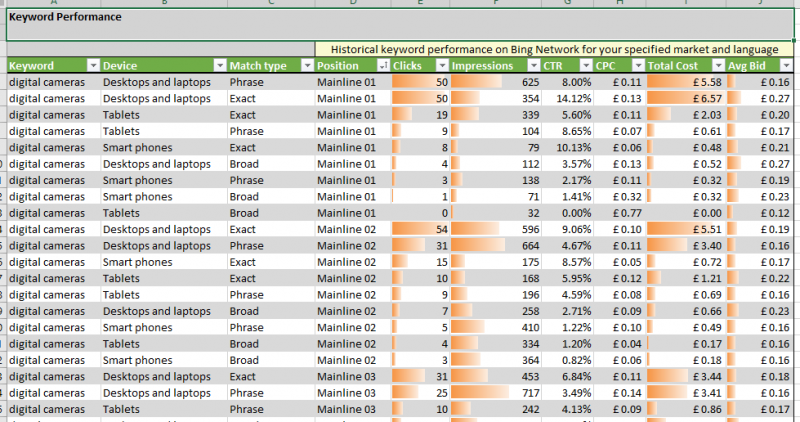 get keyword suggestions and then see detailed performance data for each of those suggestions), then it can be cumbersome. 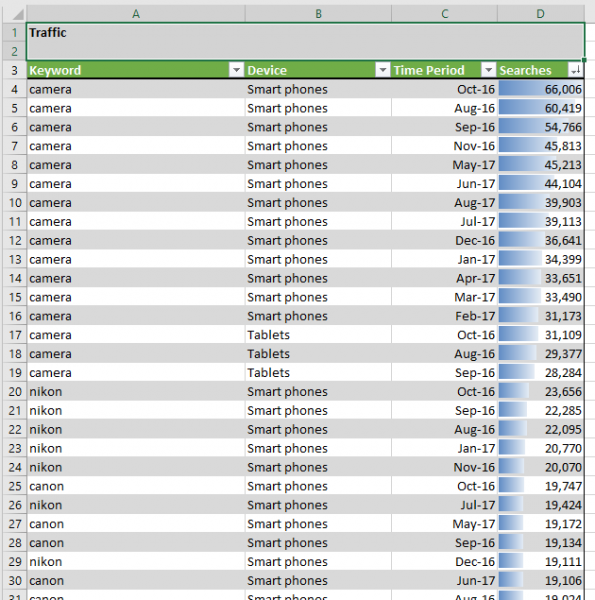 With using the Excel plug-in, you never have to do more than copy and paste – usually, you just have to click a few things. Easy! If you want some help with putting together new campaigns, or want to understand what sorts of keywords your competitors might be bidding on, the plug-in is invaluable – particularly if you’re working with smaller budgets and you perhaps want to find the more niche, long-tail opportunities to help maximise your budget. And we build all that out from 3 keywords with a few clicks of the mouse. 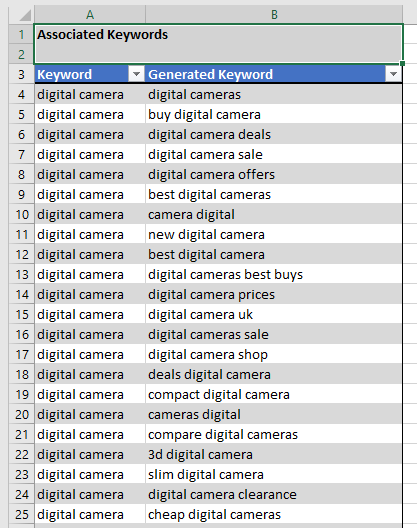 Some of the Keyword Templates are only specific to the US market, but there are some amazing templates that can help with detailed research and analysis, or campaign build out. Finally, my favourite tip. 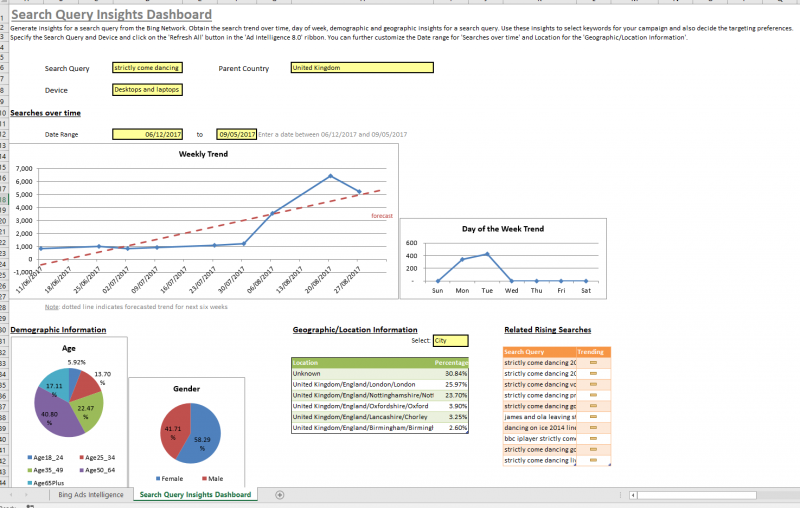 This is a fantastic use of the tool suggested by Melissa Mackey of Beyond The Paid. (You can also follow her on Twitter here.) If you’re looking to improve the Landing Page Relevancy element of your Quality Score, this is the best way to go about it – regardless if you’re trying to do this for your Adwords or Bing campaigns. Let’s say I’m working for a holiday brand, trying to improve the Quality Score for my keyword [holiday deals]. I’m currently sending the traffic to a “Package Holidays” page because there’s no dedicated “Holiday Deals” landing page (maybe there should be, but we’ll come on to that!). I’ve identified a couple of other suitable pages, but how do I know which one to try? Well, by using the Webpage Keywords option, I’m able to get a sense of which pages might be considered highly relevant for certain terms. I simply include the URLs I wish to test and run the report on each URL. Well, on the page that we’re currently sending the traffic to, the relevancy score for “holiday deals” is quite low – 0.4 point something out of 1.0 – which probably explains why our Quality Score is suffering in this area. Of course once the new “holiday deals” page is there, using this technique is a great way to check that the content on the page meets your relevancy needs. You can also do this for your competitor’s pages – to help reverse engineer what might be making certain pages work effectively for them. Pretty awesome, right? There we have it! 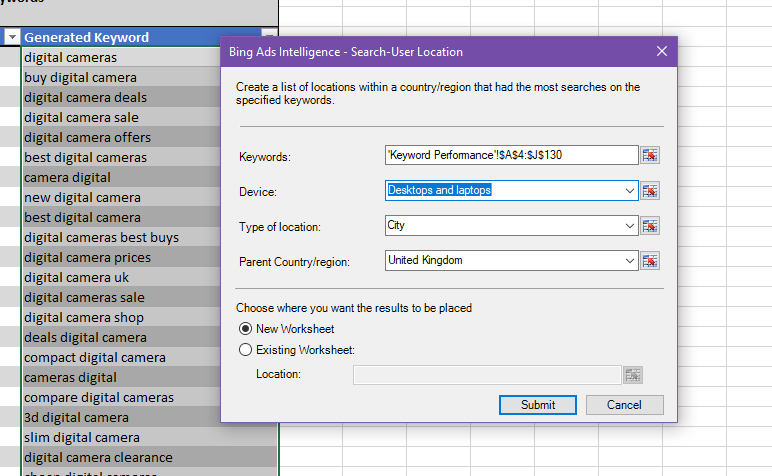 Some things that I reckon you probably didn’t know you could do in Bing Ads that will both improve your campaign performance and enhance your general workflow – particularly if you start using the Intelligence Excel Plug-In. Do you have any other favourite tips and tricks on Bing that I’ve left off this list? Let me know in the comments! Arianne Donoghue is the Paid Media Development Manager at Epiphany. Having started off her digital career client side over a decade ago, Arianne has worked for both agencies and brands in-house, specialising in all things paid search. She is now back agency side supporting on biddable media digital strategy. You might see her at a conference where you're welcome to chat to her about her love of knitting and F1 (as well as all things digital), although you're more likely to see her trying to make her way up Yorkshire's hills on her small-wheeled Brompton bicycle. How to Decide – Robots.txt Or Meta Robots?